In a bid to support the languishing economy, the government has introduced a second phase to the ‘Help to Buy’ scheme. Originally the scheme only applied to first-home buyers looking at newly built homes, but the launch will mean that all first-time buyers will get support from the scheme. Property agent Chesterton Humberts told The Telegraph that the government is hoping the scheme will “attract people out of the private rental market in favour of homeownership.” They said that “this will create more competition between landlords who want to secure good quality tenants and is likely to push average rents down.” The early launch of the scheme could see the average London rent go down by as much as 5%. This means that landlords all over the country look set to face fiercer competition not only to attract the best tenants but to retain the value of their investment. Advice from economists and letting agents all agree that the only thing you can do to ensure your investment continues to yield a good return is to make your property more attractive to prospective tenants. If you’re a smart investor, you will have put some of your rental income aside for maintenance. Realestate.msn.com say that “most experts recommend putting aside 25% of your monthly rent income for future maintenance and repairs.” While it might sting your pocket at first, you will reap the reward of improving your property with better quality tenants and long-term yield. Here’s five things landlords can do to command more rental income from their investment property. Whether you’ve got some tenants about to move out, want to increase your rent, or attract a higher calibre tenant, the first and most important thing you can do is freshen up the property. According to Garabys, it’s essential to make sure the property is clean because “a prospective tenant might easily be put off by a dirty kitchen worktop, and certainly by an unclean bathroom.” They recommend that you “pay attention to those areas that you would expect to be spotlessly clean in your own home.” If you can’t do this yourself then hire professional cleaners, especially if the property has been vacant for any length of time. Be sure to air out the property well before it is showed to prospective tenants and get on top of any bad smells or odours that indicate damp or mould. Choosing the right appliances can affect the look of your property but also add value. By installing high quality kitchen, laundry and hot water appliances you’ll not only be improving the live-a-bility of your property but you’ll find that you’ll have fewer problems with breakdowns and maintenance. If you live in a hard water zone, install a water-softener as this can ensure the longevity of all your appliances and water fixtures. Tenants won’t go to the trouble of ensuring your appliances are well looked after, so it’s up to you to prevent trouble before it strikes. The same goes for light fittings and taps. Install high quality, durable fixtures and fittings to ensure everything stays in good working order. The Kitchn Blog recommends hanging pot racks to free up cupboard space. 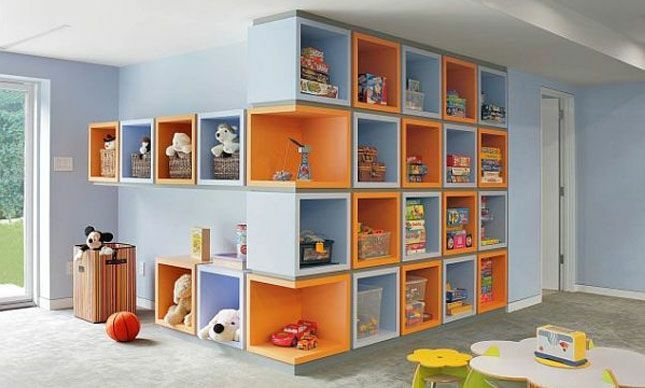 Install as much cupboard space and shelving as possible in all rooms. Install wardrobes in large bedrooms and shelving in even the smaller rooms to reduce the need for bookcases and the like which take up valuable floor space. Put hooks on the back of doors for coats and hanging vertical racks and plenty of racks for towels. Consider under-stair storage for smaller urban properties. Low maintenance is a big consideration for busy tenants. Most of the time they won’t own a ladder or a lawn mower, so if you’re going to have expansive lawns and hedges that need trimming, keep the right equipment in the shed to facilitate the maintenance of the landscape. Don’t install horizontal blinds that require special attention to keep clean, hang plain curtains, and make sure they’re lined in areas that receive a lot of sunlight. Provide spare carpet scraps and mats for all entry points to ensure the carpets are kept as clean as possible. Put plenty of hooks on walls or provide a picture rail so that your tenants can make the property theirs without worrying about patching up the holes afterwards. When you’re looking to attract and retain the best tenants and the highest acceptable rent there are no short-cuts. What you put in, you will get back. Keeping the property well-maintained, attractively presented and fitted with high quality fixtures and appliances will mean that you can command the best rent possible and ensure the well-being of your tenants and your property. Jessica Bourne is a writer based in Chester. As a renter herself, Jessica knows all to well the short-comings of rental properties. Along with lifestyle topics, Jessica has years of experience in a range of areas from personal finances to design. Jessica’s articles are often published in online magazines, blogs and websites and you can even catch the odd printed article in various publications.